How Jackie Chan became so popular? The name of Jackie Chan brings to mind fight sequences, kung-fu stunts, acrobatics, and many more. Martial arts style and his acrobatic skills have catapulted Jackie to fame unparalleled in nature. He is an actor, director, writer, producer, singer, choreographer and martial artiste. Jackie Chan is a world famous actor born in Hong Kong April 7th 1954. His father was a cook in a French consulate and his mother a maid in the same place. After his parents migrated to Australia, he joined the Chinese drama academy to learn acrobatics, singing, drama and kung-fu. He started his movie career at the age of 8 in the movie, “Big and Little Wong Tin Bear” in 1962 and went ahead to become a world famous action hero with many movies as box office hits. Jackie`s name was originally Chan Kong Sang, then when he joined The Peking Drama Academy, he was called Yuen Biao. Then he rejoined his parents in Australia and worked on a building site. It was here that he was called Jackie, as everyone found it difficult to pronounce his Chinese name and called him, “Jackie”. Innovative stunts which he does himself and has broken his nose twice, fingers many times. Movies of Jackie Chan Some of Jackie`s movies that made him world famous are: Rush Hour, Shanghai Knights, Police story, Rumble in the Bronx, The Tuxedo and many others like Project A, Cannonball Run, Super Cop, Forbidden Kingdom. Some of Jackie`s movies that made him world famous are: Rush Hour, Shanghai Knights, Police story, Rumble in the Bronx, The Tuxedo and many others like Project A, Cannonball Run, Super Cop, Forbidden Kingdom. 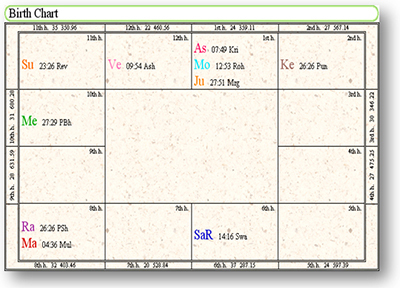 Astrological Study of Jackie Chan`s Chart Study of his birth chart reveals certain combinations that have given rise to such degree of fame, fortune, wealth and love of people. His extraordinary skill in martial arts is due to the placement of Moon sign lord Venus who occupies the sign Aries, most powerful fiery sign of Mars. He has Taurus as Moon sign with exalted Moon along with benevolent Jupiter forming Gajakesari Yoga. This yoga gives one name, fame and popularity across the globe. Jupiter in Moon sign becomes strong to bestow good fortune. Moon sign lord Venus and the 9th House lord Saturn are opposite to each other forming Lakshmi Yoga. This is also an important yoga to amass wealth. Venus is the lord of the 6th house. He is placed in the 12th house from the Moon sign, causing Vipareecha Raja Yoga making him rise to a high position in an unexpected way. The placement of Mercury and Venus in the 12th house and 2nd house from the sun causes Ubayachari Yoga. 2nd house stands for accumulation of wealth. Mercury is the 2nd house lord from the Moon sign who is placed in the 10th house bringing him money along with fame. This is called Amala yoga.